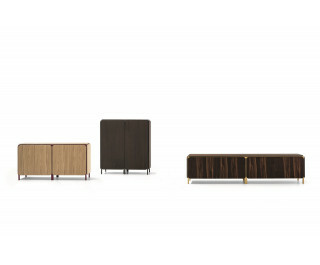 The Frame collection is the epitome of an alternative way to design a sideboard: it stands out for the metal frame which makes up the structure, while the side panels and the wooden top are inserted within the frame, leaving an empty space thanks to the rounded corners that leave the metal frame visible. The contrast between the frame, which is painted in a variety of colours, and the various finishes of the wooden panels lends this sideboard a dynamic appeal. It is available in three different sizes.